It's taken me a while to resolve this problem, but now it's solid. 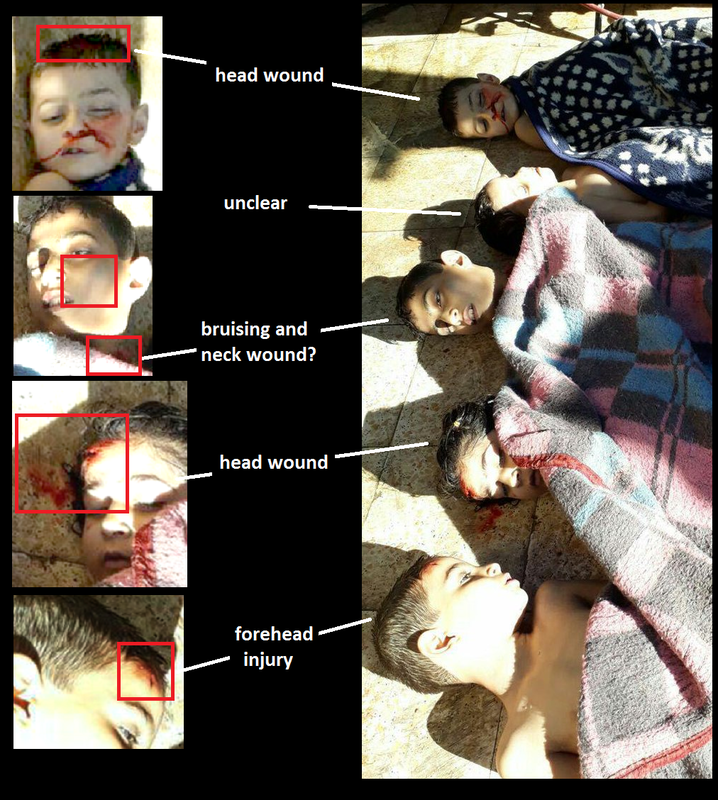 On day one we noticed the significance of head-wounded children in this photo, my labels added: all but one of these five kid shows some suspicious violence to the head, face, or neck, that seems likely fatal in at least one and maybe three cases. 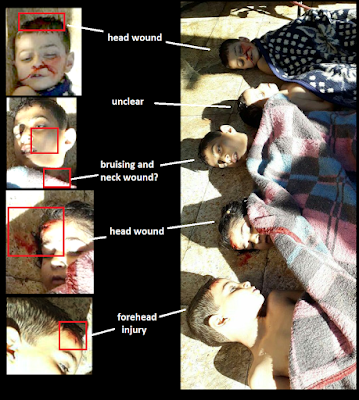 Considering other clues and precedent in past incidents I've looked into, it's very likely these children were executed when "Assad's sarin" was too slow to do it. Less noticeable - but I caught it right away - the oldest boy in the middle of that photo may have a different wound. He appears around 13 years old, and would probably be considered a man by Islamists. 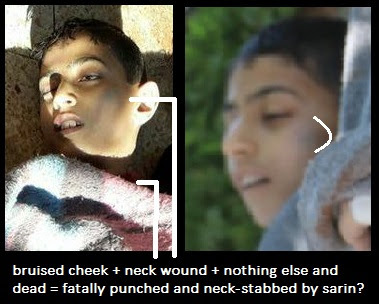 (by proximity to other Imadeddin Al-Qadah victims, he's probably be Mohamed Imad Al-Qadah, age 12, as Qoppa999 suggests). That could mean he would be executed differently in a massacre situation; I've seen suggestions before that men will be shot, or have their throats cut, while children will be head-hacked, or often strangled (and women tend to just not be shown, or even listed, or proven to not be sold off as a fundraiser...). That impression may not mean much, or it could be just why Mohamed (as I call him now) has red on the neck instead of on the head. Quick support: as Mohamed is seen laid out with other children in a pickup on top of a blue blanket, he happens to have a blood-colored stain right under his neck. (at right, black circle, compared to unstained color in the blue circles). It doesn't appear to be a usual jugular cut, probably just a hole, from this, either to the back or the left side of his neck. A skilled killer could well access it from this less-obvious angle, and cause a swift bleeding death. Note that in most other images, the left side is carefully hidden, his head often turned sharply to the left and even tucked into his shoulder as in that verification view. First photo, truck video: time somewhat unclear, but probably before 10 am. But the image at right above is from another scene, where his neck isn't as hidden. In another view, we can see his face enough to verify a match by facial bruise (besides the face and hair pattern matches). From the start, I saw a bruise on his left cheek, consistent with a punch and not really with shelling. It looked like possible shadows at first, but really seemed too blue. Most views hide the left side of his face just as they do the left side of his neck. But I just saw a photo including him (Kobs tweet) where we can see well enough to verify the bruise. That's some lucky shelling - perhaps bruised his face like a punch would, and maybe pierced his jugular, causing no other marks we see, leaving him looking, from most angles, like an unscathed chemical victim. A video of this scene: the bruise matches, and we can see he's wearing nothing, but is associated (barely covered) with turquoise shorts, and no shirt at all - left side of his neck is visible here, but no blood! Nor do I see any sign of it in the water pooled under his neck. Careful measurement of solar elevation suggested a video of this scene was about or a bit under 50 degrees. Michael Kobs and I both measured it and got the same angle. That would put the time at 10:40am or actually a few minutes earlier (foreshortening - the difference once placed on the clock is very small). 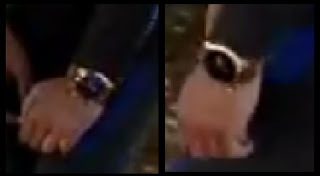 Later, Andrew (in comments) noted a wristwatch - it seems to say 11:40 (hands nearest to the 8 and 12), so maybe a confirmation, if he's set an hour ahead? 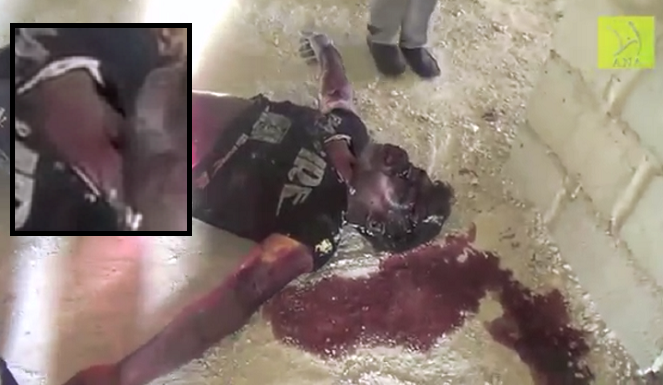 Anyway, it's later by far than the other images, and he's apparently not bleeding from the right side, as it seemed. And there's no sign of blood in the water under his neck at all. Would any serious wound stop bleeding on its own that quickly? I publicly admitted being stumped, tweeting this graphic summary a while back. So either it's all a coincidence, maybe the one video was altered (no, I never argue this except once, out of hundreds of cases). Or it's the still unseen back of his neck that was cut, and somehow it's not bleeding by 10:40? That's where I left it. Now, we have enough of an answer to continue. 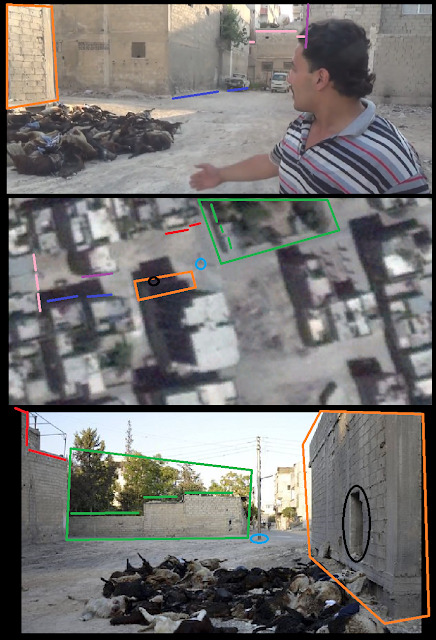 First, to complete the above picture: Mohamed is seen at the end of this SMART News video being loaded along with other children into a van, ostensibly for more serious treatment at some hospital. He's seen briefly as Qoppa 999 noticed; the same skinny kid in blue shorts and apparently his shirt, in some state that's maybe not quite on... His neck is not seen, but his head may flop back more than it should, and the loading might be almost too swift, like they don't want us getting too much of a glimpse. He has mud on the right-back quadrant of his head, meaning he's been laid down in the mud already, and at some point, the left side of his neck was turned up and visible. I happened to review this same SMART News video just now and I can say his neck is bleeding in that last image, unless it stopped suddenly. At 1:20 we may see the famed star witness Abdelhamid Al-Yousef (to be added here), conscious but playing sleepy until the water spray hits him. Good solar timing will help say when this is and how it fits with his story. Coming soon. But to the left is another set of clues. Considering what we have above, the details here should need little narration at this point, but I'll add some anyway, beneath it. He came in wearing a jacket that's lost quickly, already with no pants or shoes, and there goes his shirt. He's laid here with mostly men; the medics, like maybe his killers, consider him an adult. Just have a look at the copious blood first across the other guy's arm, soaking into the black sleeve (where Mohamed's neck had rested? ), and then into the water a bit to the left (after he was moved? ), and now into the mud out of view a bit more to the left (after he was moved again? 8/30 note: probably just one move by both - they guy who complained about the boy bleeding on his arm also shifted to the right of where they were (the blood in the water spot). 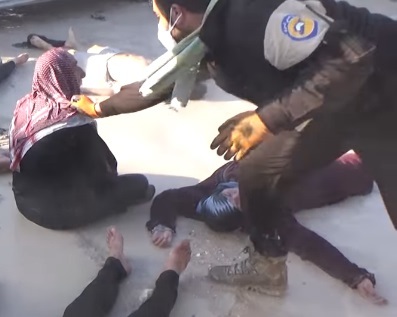 What was that White Helmets guy trying to do here? Patch up a bleeding kid to save his life, as they rushed to save him and others from the poison gas? Why use a shirt instead of bandages, give up halfway through, and just stuff him in a van to bleed on the other kids? Or was he just trying to conceal the fact that this one was already dead, and had a suspicious neck wound that could be the cause? I think it's the latter option. 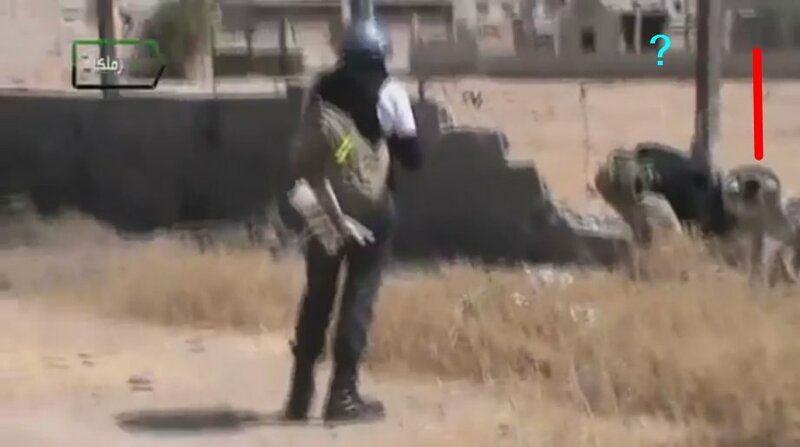 Somewhere after this, prior to 10:40 when he's seen again with the men, they got some solution that stopped the bleeding from the back of Mohamed's neck, without being visible from either side. Just what, I don't know, and maybe it just stopped bleeding (seems unlikely - this will be low on the body as laid, and prone to passive bleeding long after the pulse has stopped.) But that must be it, as it's now abundantly clear he was bleeding heavily from the back of the neck. <add 8-30>It seems the solution they found for Mohamed's bleeding is partly visible. Orbi on Twitter (@kwo_vadis) insisted there was some gauze or bandaging visible behind or around the boy's ear in that non-bleeding view. I argued it was just the sky reflecting off the water under his neck. But on closer view now, I think it's partly reflection, but mainly part of the bandage. It's visible here either under his earlobe, or perhaps on or attached to it. From there it has a fairly straight edge (like a patch of gauze might have), but the whole assembly likely wraps around however far to the still-unseen wound. Small point: maybe all those white pixels are bandage, but the hue difference, and the apparent angle between them, suggests two the patch marked in orange is the edge of the reflection I thought all of this was. 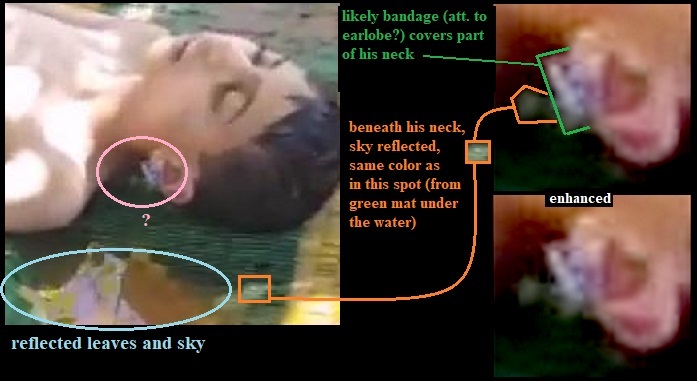 Implication: the boy was probably dead from before the first images, quite likely from this neck wound. If so, this bandaging was never meant to save or help him. But maybe that's not so, and they were trying to save him from the wound or the gas ...it appears unusually applied in such a way as to be almost invisible. That would take extra care, in a very urgent and chaotic scene, and suggests an important effort to simply make the body more presentable - stop the blood flow, and leave as little clue as possible there ever was one. That would constitute a cover-up, and suggest guilty conscience. I mean, why bother concealing blood from some innocent cause, like shelling or an accident?. The injury could be debated to some degree, but ... taking the dark view that had me noticing that blood and his age coming together on day one ... This violent event might have severed his spinal cord, constituting something like an in-place beheading. If they stabbed deep enough, they could cut his jugular vein as well, perhaps without leaving a mark on the front or the sides. Add 9/1: the wound seen? I checked the SMART news video more carefully, and found a fame that might/should show the wounded are. With some enhancement, a large part of the shaded area seems darker and redder than it should, but not as much as you'd expect. The suggested shape is of a large and fairly rough wound. There should be blood running down, even if he was dabbed dry of it just before this pass near a camera. It's not obvious, but possible we do see this: there's a faint reddish tendency down his back from there - possibly rinsed-off, watered-down blood sliding away. He is dripping wet, as if hosed off one last time less than a second before he's carried to the van. Add 9/2: I guess the scene isn't as clear to everyone else as it is to me; it's possible to see the blood in the water as a red ribbon, and the possible blood on the guy's sleeve as coincidences unrelated to the bleeding neck boy a few feet away, and the apparent desperation of White Helmets rescuers to find scraps of cloth at this moment. Just made this to highlight the connection and what I think we're seeing: something we weren't supposed to. The blood area is seen over a span of 9 seconds: here's the earliest and latest frames, enhanced. It doesn't change shape noticeably. But would it? Liquids will blend, but unlike most liquids, blood coagulates. Might this be a sort of ribbon of clotting blood? It seems flush with the water surface, but on the left side, there's a black dot at the far corner, with faint black lines long the edges from there. I propose this is a spot that clotted more fully, got heavy, and sunk below the surface (which isn't far down, but enough to be invisible now under the tan muck). On the way down, it left a tiny column of water that it cleared of mud particulates, so it appears just dark here in the shadow. The basic shape (two blobs) could be: larger pool on the left accumulated first - guy notices soaking into his sleeve (which was right next to this), and tugs to the right as he sees what it is - smaller pool accumulates there before the WH get the bleeding kid off his arm and a ways to the left. Thus freed, the guy pivots far to the right, taking on the strangely bent shape we see. And for what it's worth (something) I timed this scene by solar elevation to around 7:20 am or a hair earlier, or broadly 7:15-7:25, which is pretty early in the sequence of events. Indeed, there's still been no punishment, in the form of regime change, for President Assad gassing 1,700 innocent people to death with crude rockets dispersing impure "kitchen-grade" sarin, after inviting UN-OPCW inspectors in to watch from a few kilometers away... Well, clearly they don't mention some aspects as they urge you to never forget the big picture. Another of the many things they won't know or say is how 8-9 of those victims, apparently a family, were all killed at least 2 days before the alleged sarin rockets fell. Interestingly, these are the only victims we get to see where they were allegedly killed by the gas early on August 21. But they were actually violently murdered a few days before the incident, and then arranged here as props to help prove the incident. It's true they weren't treated as humans. The evidence at hand is stomach-churning besides tragic. I have to explain and show it now, but I'll refrain from showing more than is necessary. From the alleged chemical attack in Ghouta, a “dog did not bark” observation is that despite the mass of stills and video clips uploaded that showed victims in hospitals or morgues, no images have appeared that showed victims being rescued in their homes or bodies being recovered from affected homes. The only images from Ghouta purporting to show victims being found where they had collapsed were obviously fraudulent, showing nine alleged victims of chemical attack dead in the stairwell of an unfinished building named the “Zamalka Ghost House” by researchers. In this case, it's not their home the victims were just found in, but a large and empty, unfinished, 5-story apartment building (location found by scenery analysis: 33º31'31.11” N, 36º21'43.24” E). "Zamalka Ghost House" is not such a great name, in that it's not specific; most buildings here were vacant by this time. But it's haunted now by this case. It seems some people in the videos tried to claim this was the family's home, but the consensus is that they ran here for shelter after being out in the street. 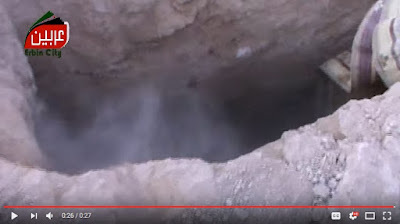 In the video: Entire Family Killed by Chemical Weapons attack on Damascus (still available in 2017), a large and excited entourage, frequently declaring Allahu Akbar, they come along the west side of the building, from the north, in late afternoon, they say of August 22 - so about 38-42 hours after the alleged sarin attack. They enter at the southwest corner stairwell. All views of the surroundings are to the west, and all victim shown are in or quite near this stairwell, evenly spaced all the way up. 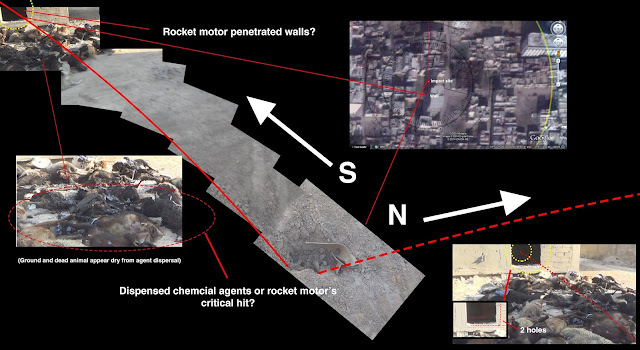 It turns out this is also the approximate site of alleged sarin rocket impact #6, the dud through the wall, as shown above. That landed just meters from the ghost house's northeast corner - so opposite of where this family would have been. So a direct relation between these is not the clearest (records suggest a wind to the southeast prevailed, suggesting they would be safe from this plume, but there were other alleged plumes, and it's all alleged and hypothetical). 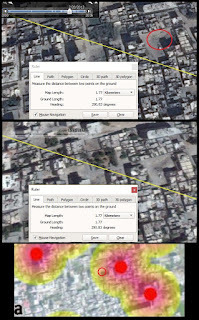 The rocket impact #6 next to this is not quite mapped by Human Rights Watch in their map, corrected at right compared to 5 well-placed impacts and one possibly placed, 4 of which they either missed or misplaced (#6 is on the right). This omission or error comes despite HRW's taking this video as evidence from one of their sources, in support of the claim of finding bodies days later (as would naturally happen). (ACLOS) Bodies found in homes, bodies found for days - two important claims, and this scene is basically the whole evidence for both of them. As we'll see, that's a very bad sign. I can verify from video 8 bodies for the reported nine victims found at the scene - a man, two women, a baby girl, an older girl about 8, three boys aged 5-10 range. The following gory details and images are somewhat optional; overview beneath tries to condense it. For each entry, victim ref #, video time, location, notes, including decay level (1-5, 5 being the worst seen). M1: At 0:40 a man on the 2nd floor with a huge pool of blood near his head, perhaps the most decayed victim; badly discolored with reddish-purple skin all over, especially where the sun has had time to burn. There's slight body bloating, with a massively bloated face with puffed-up eyes and a swollen tongue protruding. Interestingly, he has apparent hole in his lower throat, in the middle just above the collarbone (bullet-sized? 9mm?). (this may let gas escape, limiting the body bloating). He has skin peeled from side of the belly (covered here), possibly from torture, or in handling after some decay had loosened it. By the amount of blood (there will be more than it seems, soaked down into that thick dust), he was likely killed right here, but likely dragged a bit while still bleeding. Decay level 5. He alone wears shoes (appears to be loafers, on a bit loose - perhaps what he was wearing, and perhaps added later by people with too few spare shoes - see composite below). W1: at 1:08 on the stairs to floor 3, a woman in a heavy black winter coat (in late August), with blood from mouth and nose, so likely shot or stabbed in the abdomen somewhere - it rolled to the side, when she was arranged differently. Also, lack of much blood from the sliced left forearm suggests she was dragged here shortly after she was killed. (or did the skin there just split during the carrying? That's not blood on the stairs, is it? It's a chunk of tissue that casts a shadow) Despite the house being completely covered in loose plaster and the dust of war, her clothes are free of dust; Barefoot, but with a pair of sandals just inches from each foot. Possibly hers that fell off, or just laid there for effect (or because they didn't fit on her swollen feet?). Some dust on the side of right foot, soles not clear. Decay level 4 - arm is decayed worse than it looks here, but that's a wound. Hands and feet are purple, but lower (red blood cells sink in time - livor mortis). Her face isn't discolored, because it's up, and has largely drained of heavier red blood cells (pallor mortis), but her body seems bloated, her face is, and eyes are quite swollen, and perhaps leaking blood. This is odd. B1: at 1:20, 3rd floor: boy, arms and head hanging over the top step, just above W1. He has lots of blood from head/mouth pooling on the top step. By blood quantity, he was likely killed there. Decay level 5 - skin all purple, seen flipped over in a later video, his face is nearly black, and his eyes have bulged clear out of their sockets (partly just from hanging like this), and a swollen tongue sticks out of his mouth - blood from mouth/nose... barefoot, with no footwear seen nearby. W2: 1:30 in the entrance to a side-room on 3, a woman in heavy winter coat, torn, with layers beneath. barefoot, purple, swollen face, puffy eyes, blood or bloody fluid from mouth, nose, eyes (seen more in a later view). Decay level: 4. barefoot, with no footwear seen nearby. G1: baby girl, laid next to W2. - possible "foam" near mouth, blood from nose, no injuries visible. The dust on her clothing, flattened face and bent arms say she was left with face and palms down, elbows up, for some time, then arranged here. (it was somewhere dusty like here, and that's dust, not foam, on her face). The red face could just be livor mortis, red settling low after death, as if face-down. Her bent arms suggest rigor mortis, which peaks 10 hours after death and then the body loosens within about 24 hours, or faster yet with small children. So with frozen eblows, and knees, nearing sunset on the 22nd, she must have died more recently than the others, like evening of the 21st, and was added to the scene before the video shoot. Also note she's not bloating in the body, face, or eyes, and not purple colored - she's pink like the freshly dead - perhaps even too red like the Kafr Batna victims (see Denis O'Brien, Murder in the SunMorgue, still available at Scribd, even as O'Brien's site has expired). Not as relevant for a baby, she's barefoot, with no footwear seen nearby. B2: at 1:46 on the landing before 4th floor is a younger boy in a black-and-yellow shirt. He's laid face-down, with lots of blood from the face area- a large puddle sugg killed here, but it seems dried at least 2-3 days - possible cheek scrapes - skin on legs appear sort of sun burnt, probably more than 1.5 day's worth - , decay level unclear: little discoloration, but seen rolled over, he has severe swelling of this left cheek, dark veins, and a swollen tongue sticking out of his mouth Barefoot, with no footwear seen nearby. B3: 2:34 4th floor or roof? a bloated and sun-darkened boy, blood from the mouth and nose, extra-dark and possibly bruised face - flattened nose, seemingly beyond the pulled-flat effect that can come with bloating - swollen eyes, with one far worse - possible eye damage, blood from eyes across, or perhaps a wound to, the bridge of his nose. He might have been beaten in the face. Decay level 4. Little or no blood on site suggests he was killed elsewhere. 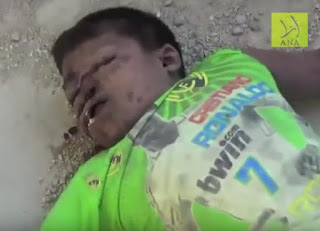 Bright green Christiano Ronaldo t-shirt has the left sleeve torn off (during a futile struggle with the sarin, perhaps?) Barefoot, with no footwear seen nearby. Little to no dust one the soles of his feet (one heel and one set of toes seem lightly dusted). G2: 3:00 at the top of the stairs, a girl of about 7, yellow Hello Kitty shirt - but massive thick blood and copious whitish goo (too much and too weird to be natural?) seems forced from her mouth and nose well after death (as if her body was full of this mess, and someone stepped on her belly?). Similar flattened nose to B3. Advanced dark decay in the veins, causing gray-brown color, but no notable bloating (maybe she was bloated until someone stepped on her belly?). Her eyes are also not puffed out, like most, but she has a possible ring of white residue around them. Decay level: 4. little or no blood on site, suggesting she was killed elsewhere. Barefoot, with one adult-sized sandal laid near her head. Little to no dust one the soles of her feet. Bloating, discoloration, etc. is most consistent with about five days worth of decay, that must have begun prior to the alleged sarin attack less than 2 days before the videos are taken. Clearly, they were killed separately and prior to that event. At last the man, M1, was likely killed on-site, but mostly the bodies seem arranged here after a killing somewhere else. Some apparent differences in decay might prove later planting, or not - only the baby G1 is clear in a difference, appearing dead perhaps too late to be a victim of the attack (rigor mortis persisting late on the 22nd). This suggests at least two, and perhaps three phases of planting. First M1 was killed, perhaps with B1, W2, B3, and G2 killed and/or planted later. Then perhaps W1, and B2 were added, and last G1 was laid in place to complete the entire and growing "family." This is elaborate scene management with no regard for truth or humanity. And if any of this stairwell staging was done before the 21st (unclear but possible), it was by people with foreknowledge; they knew evidence would soon be needed for a story with poison gas people would die trying to escape. 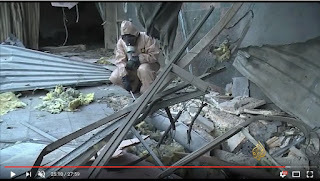 Some views suggest a later-yet viewing of the same bodies in the same building, with slightly more decay, in a video posted only on August 28. But that could be the higher resolution (focus is W1's arm wound). 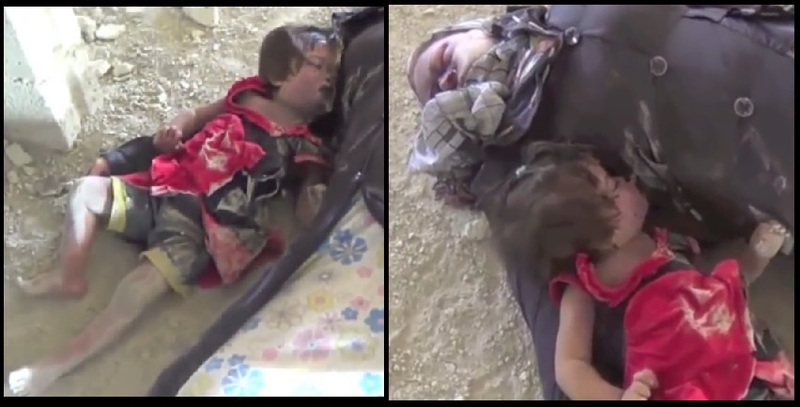 And another video: East Ghouta 22-8-2013 Unidentified children were found to be chemical victims uploaded on the 23rd and dated 22nd, shows G1, B1, and B2 are carried on a rug to a small trench. The rest are seen piled on pickeup truck nearby, ready for burial. The rug is then dragged over the edge, and so the kids are summarily rolled into it, with possible disdain (right: rug waving and dust rising as they land down there). So they were removed and buried either later on the 22nd or at least before that video upload at (UTC): 10:53:53 - almost 2 am on the 24th in Syria. So it's possible they were left for another day before being dumped on the 23rd, but more than likely it's all the 22nd like they say. It doesn't matter greatly. These icky signs of decay are not the work of any chemical I know of. CRBN expert Dan Kaszeta, otherwise favored to accept opposition claims of just this sort, decided these people were killed by "conventional munitions." (via Matthew Asheville here). But that seems true only if we take it as meaning guns and knives killed them, not bombs and definitely not sarin nerve agent. It's also not the effects of fuel-air explosive or or "vacuum bomb," as Ashville argued. However, it's possible the actual deaths or some injuries before the decay were caused by the blast wave and suction effect of an FAE blast, or with some poison. The purple color we see could be cyanosis, a blue shift in the skin caused by some poisons or conditions that lead to low blood oxygen. But at least in part it's the darkening of decay, as blood vessels burst and bacteria spread, since it comes with the other signs like bloating. The bleeding eyes are more unusual; they don't seem violently gouged (eyelids all intact), so possibly some chemical exposure that burns the eyes and airways - that could cause bleeding from the eyes, nose and mouth, and damaged eyes would decay and swell quicker than usual. One chemical that causes tissue damage and cyanosis is chlorine. Depending on impurities, nasty terrorist sarin, with its noted caustic effects, would cause these things to some degree. 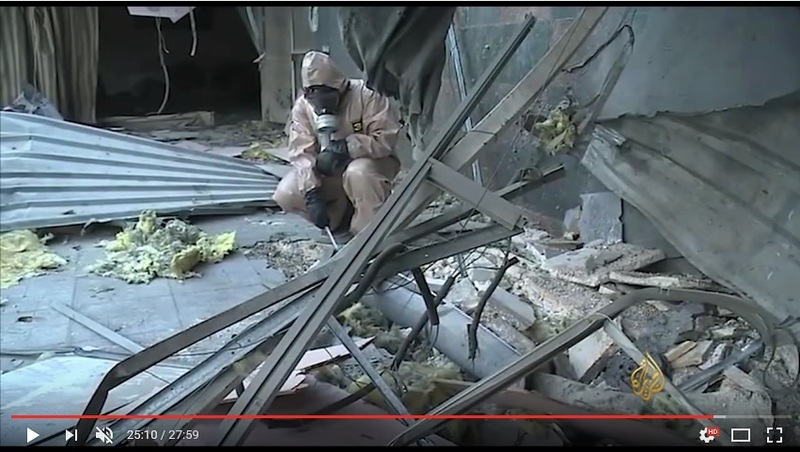 But of course to be this decayed, they had to have been poisoned well before those alleged sarin rockets fell. Further, some poured out probably too much blood for this to the whole story, and M1 at least was probably killed in the end by a gunshot to the throat. In the video we can also see buzzing flies, but interestingly, no maggots I can see. There should be sizeable day-old ones, with this much decay. That could mean a real release of sarin or similar in the last day or two. But the sarin attack couldn't kill these people before it happened, although it - or an early planting, or other release of sarin or similar nerve agent - might have killed the first maggots that had hatched on their bodies. Possible poison clues aside, we can ascertain violent murder as obvious in one case (M1), almost obvious in 2 others (W1, B2), and likely in the rest. We can see their bodies dragged into place to tell a fictional story, suggesting little respect for the victims (they're used as props, simple things). Those false stories had the effect of concealing the violent massacre. Therefore, the activists blaming Assad (and they're all Islamists) are also concealing brutal crimes (probably by allied Islamists). It clearly happened at least on this scale, and possibly on a much larger scale, like the entirety of the Ghouta massacre. The heavy winter coats worn by the woman and the bare feet tell a different story. Who would keep a huge coat nearby or on year-round, even in late August? The homeless, with nowhere to hang it, for example. Or hostages, whose home is a cramped basement with no storage. If the captors are Islamist, women might be required to cover up with the longest, blackest thing they have in their closet before they're taken to their new home. And who goes around barefoot in a war zone? People who might put on a long coat because it really was chilly at 2 am? No. Hostage who don't go walking around? Maybe. Or those about to be executed; Islamists often make them take off their shoes first, and their bodies would keep not having them if they were carried around from there. Or, as we're told, at the 2 am attack, these unidentified victims got (or were?) dressed, some with coats but no shoes because of the chill or the rush, ran or were outside, "found this abandoned building and they ran up to the upper levels," without getting any of that deep dust covering every step on their bare feet? Returning to the story-telling, where none of this was mentioned... The Douma-based, Saudi-supported genocidal Islamists of Liwa al-Islam manages this area and probably all its massacres and concealing stories (see here for some info on them and their crimes). German blogger Urs1798 notes among those documenting this scene, a certain team of "activists" from Harasta or Douma (see ACLOS) who have previously passed off terrorist massacres of their hostages as regime crimes (see Douma Hostage Massacre for an obvious case). ITV News (UK) has videos, including these victims, that was re-used by CNN at least. 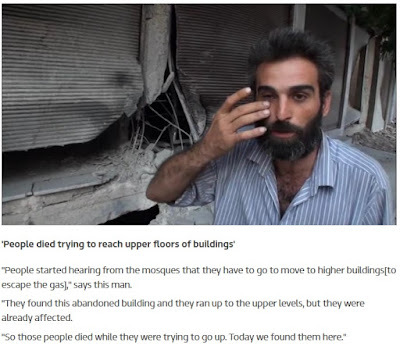 An Islamist activist (camera-friendly variety: lightly-bearded, western-dress) at another alleged impact site describes the Ghost House victims and gives their story as if he saw it himself. He tells ITV how he learned a gas attack had happened and, as translated "more shelling started. Then I fell on the stairs and was unconscious." He had friends as was saved, but this helps show how people around there fall unconscious, especially on stairs! In case you don't believe the story he was about to tell, this is supposed to help grease it along. He explains next how some stair-fallers weren't so lucky. According to warnings broadcast from the local mosque, the man says, these people and others sought higher ground to escape the heavy cloud of nerve agent. "They found this abandoned building and they ran up to the upper levels, but they were already affected. So those people died while they were trying to go up. Today we found them here." "The next morning we found each family in their home as they were, dead in each house," he says. None but this one batch is shown. "All had foaming at the mouth, and some from the eyes. Some had blood from their ears." Blood from the ears/head/neck wounds, and blood from the mouth and nose that he didn't mention, and discoloration and bloating he didn't include, are not sarin symptoms. But they are seen in this set of victims, so he goes ahead and claims them in this case. (In the frame above, he's indicating "foam" from the eyes like G2 and perhaps others display.) Probably unlike the many other cases he claims, these 8 victims had that foaming/bleeding problem and fell on stairs - the very things he's careful to explain as effects of the regime poison attack. So they show us only this scene, and it seems his whole story is geared towards explaining just this one scene; even his own mind it seems to be a transparent stand-in for the vague "many others." Noted. "We found more than 40 bodies since yesterday and the search is still on. If you come with us we can show you more," the same man continues. He says he helped bury - and explain? - more than 150 bodies, and he has more on hand to show. What role could he have in so many burials is unclear - he might have had a small hand in that total, or he might be overseeing the work of whole teams. We know only some of the coverup was with dirt, and some with words. His hands aren't dirty, but he's talking. 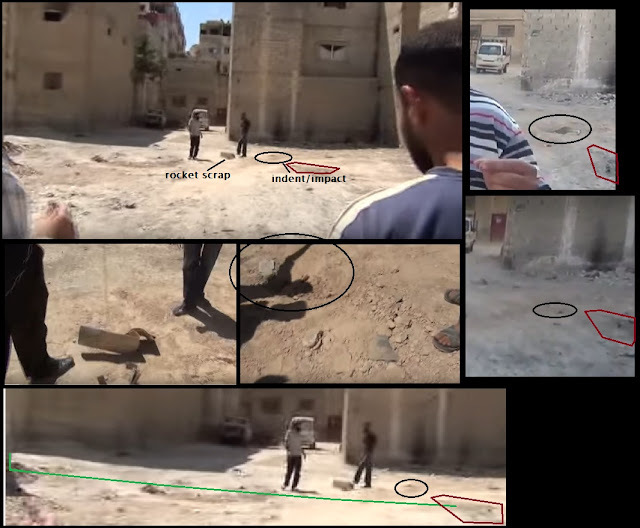 Another man working with him, shown at right at the nearby rocket impact, told ITV "After the chemical attack yesterday we found the remains of this rocket here today," at the same time they first found the ghost house victims. This rocket is one of what he's sure are 12 total they they heard impact, albeit in a less noisy manner than usual. He explains "We witnessed all those people who were martyred and the physical effects it had on people. We opened many houses in this area and we found the families dead." But apparently none of these scenes were filmed, and this second-day effort in a vacant building was the best they could manage, by way of a stand-in. 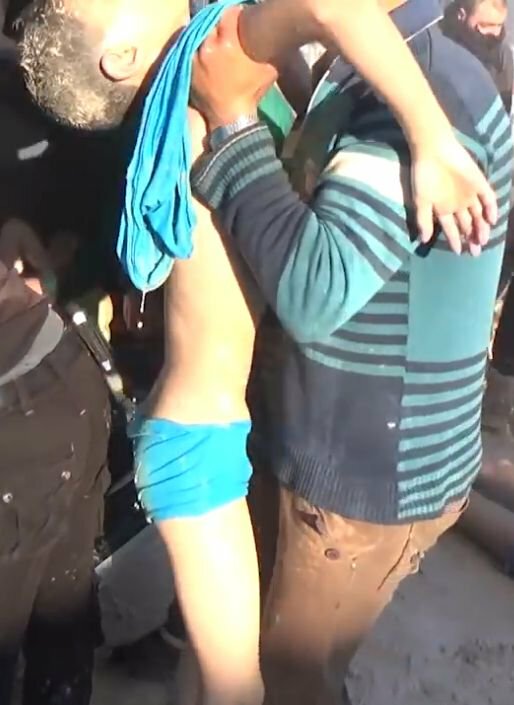 It stretches the imagination that these guys in a war zone could honestly mistake putrefaction for indicators of sarin or of whatever unclear mix of poisons was actually used for the Ghouta massacre. If they had seen many of the same bodies we have, they should know these were atypical signs at any rate. They should have seen many dead people and animals by then, and probably could not fail to recognize the work of body decay. It's their more insulated audience they were presuming would have no clue. These guys with the short beards had to know they were trying to pass off a days-old massacre. In the video we can also see buzzing flies (but interestingly, no maggots as noted), and a lot of plugged noses and waving hands as they examine the bodies. People wouldn't stink like that just 1.5 days after death. What the activists add in explanation just adds to the shadiness of this picture. The "entire family killed by sarin" story - alone, as far as I know - holds up one central claim of this crime of the century. That's the claim that people in the general public were killed in this chemical strike on civilian areas. That claim collapses; we have no evidence people were gassed at home or at liberty on the streets to run and collapse where they chose. This evidence was meant to be the example to prove others died the same way. If we go ahead and do that now, we should expect this: the rest of the x-hundred victims were murdered by Islamist captors, probably in a few centralized gas chambers, and then arranged in other settings (allied clinics and morgues, but not in houses or on the street or even in this ghost house), and used as props to support the fake "Assad sarin attack" conspiracy theory. We opened with Bethan McKernan who wrote recently, in acceptance the unsupported opposition narrative of Ghouta: "Syrian, Russian and far-right and far-left conspiracy claims that it was a “false flag” attack by the rebels have been thoroughly debunked." I just wanted to be ironic and symmetrical by closing with that totally unfounded statement. It's now been four years since the infamous Ghouta chemical massacre of August 21, 2013 killed a reported 1,400-1,700 people. By visual evidence, it killed at least 3-400 people, and was clearly the single deadliest incident of the entire war, even up to now. Confident blame was widely and swiftly set on the Syrian government, despite the obvious negative motive they would have, and despite many serious questions. As it happens, I'm in the middle of a review of the rocket firing directions. I'm still not convinced the "volcano" rockets really had anything to do with any sarin, or with any of the mass casualties. I still suspect they were used as fuel-air explosive weapons (see initial reasons here) with the sites contaminated later, leading to the sarin-positive environmental samples taken more than a week after the incident. But the rockets still matter in at least some regard, and in the time since, I've gotten better at reading clues like where each one impacted, and from what direction - things we never did cover very well. That analysis is ongoing (with sub-posts and overview collected and developing at this masterlist), with some revision of accepted estimates. The latest draws on six gelocated impacts, carefully placed on the map, (mostly just now in recent weeks) and 3 other sites unplaced (two of those just now added). With the new findings thus in the works and their implications unclear, I'll mark the date with one important finding that helps expose the fraud behind perpetually blaming Assad. This comes from what irked me into re-examining this; stumbling across a bad error or a motivated lie "buried" in the UN's first report in September, 2013. 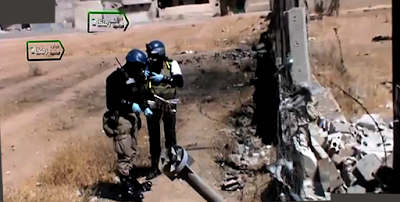 Just as the U.S. and others were pushing the idea the Syrian government must have launched the sarin rocket attack, as alleged by science-impaired Islamist activists, the supposedly impartial UN quietly "confirmed" that, with supposedly science-based findings of the OPCW investigators. But the celebrated findings turn out to be totally bogus. I hadn't noticed at the time how problematic or annoying this was until recently, and so now I'm writing about it. Of the five impact sites investigated by the mission, three do not present physical characteristics allowing a successful study of the trajectories followed by the rockets involved, due to the configuration of the impact places. 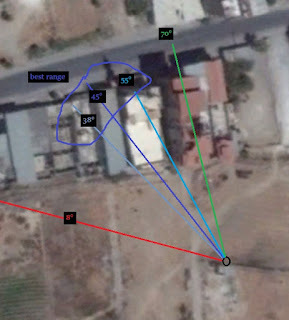 However, Impact site number 1 (Moadamiyah) and Impact site number 4 (Ein Tarma) provide sufficient evidence to determine, with a sufficient degree of accuracy, the likely trajectory of the projectiles. It seems they actually claim 3 of the five impacts do show a direction, with two of them in the distant Moadamiya attack in West Ghouta, using M14 artillery rockets instead of the larger rockets used in Zamalka. They specify only one: "Impact Site Number 1" but go on to mention an "Impact Site Number 2" nearby, with a similar and consistent reading, both pointing north to Mt. Qassioun about 10km distant. So... this is impact sites 1 AND 2, besides #4, for a total of three that show direction, of the five sites total they looked at. This leaves only three sites possible in the East Ghouta area, out of a supposed 12. 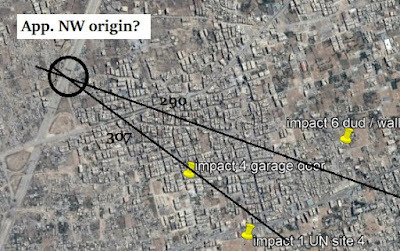 These would be the rooftop impact (must be site 3, visited at the same time as #4, and just 170m away, on August 28), and another home interior they're seen examining (not placed, must be site #5, visited Aug. 29). That's only one field site, which they're also seen at. They're clearly seen at no other sites except going to or from their vehicles or driving around. So there can be no confusion which rocket they refer to here - the one I and most others have listed as #1. It's relatively easy to place, but the suggested firing direction is more flexible: taking it as relative to the almost E-W running wall, I and others have estimated in the range of 60-70 from parallel (or 30-30 from perpendicular to it). but with some help from Michael Kobs and his carefully set-up scene analysis, I now feel around 40 or 45° from parallel is correct. But the UN's report - widely accepted as factual - suggests it would be about 8 degrees from parallel with the wall (red line runs 285 degrees on the compass). The projectile, in the last stage of its trajectory, hit the surface in an area of earthy, relatively soft, ground where the shaft/engine of the projectile remained dug in, undisturbed until investigated. The said shaft/engine, presenting no fonn [form] of lateral bending, pointed precisely in a bearing of 285 degrees that, again, represent a reverse azimuth to the trajectory followed by the rocket during its flight. It can be, thus, concluded that the original azimuth of the rocket trajectory had an azimuth of 105 degrees, in an East/Southeast trajectory. It seems this really is their reading. Elsewhere in the report, they say the rockets appear to have come from an unspecified "northwest," which seems accurate enough. But the 285 only direction they published is barely northwest, just 15 degrees north of due west. Anyone can see, once it's mapped out, how drastically wrong that is. All reasonable readings with visual explanations involved are in the range of 315-347°, broadly and accurately, if not "precisely." If any of us had been there to measure it, we'd have a more exact answer almost surely in that range. But the UN-OPCW folks seem to have a different kind of science less related to the 3D world we inhabit, and so they failed to do that. They measured it as nearly parallel to the wall and assure us if we had been there, we could see that plainly from the way it was aligned. We can see how you can't see it on a video of them being there, so I guess it's simply being there in person, with Islamist minders looking over your shoulder and NATO folks, Turks, Saudis, and Israelis breathing down your neck. It seems a special and privileged kind of science emerges in such conditions. It's this kind of science that seems to matter to all the powerful folks who matter. Untrained outsiders cannot understand it nor, obviously, can they challenge it. Finger-Pointing Accepted as "Not Pointing Fingers"
In fact, it stretches the imagination that they would honestly err by such a margin - some 30-40 degrees. I see no good reason, except to point at a Syrian military base - approximately anyway. This line followed out intersects with the southern part of the Republican Guard's 104th brigade base on Mt. Qassioun. 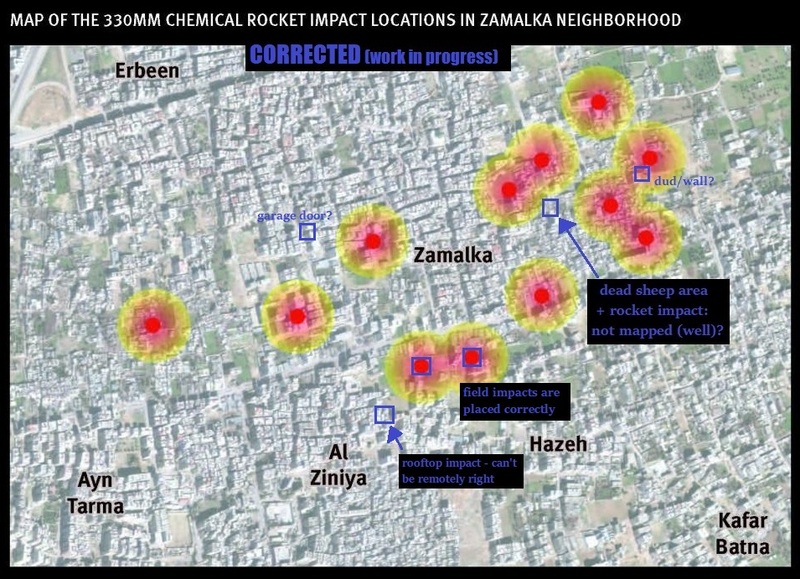 That's about 9.6 km from the Zamalka impacts, and 9.5 km to the Moadamiya impacts, as Human Rights Watch maps it. (right). 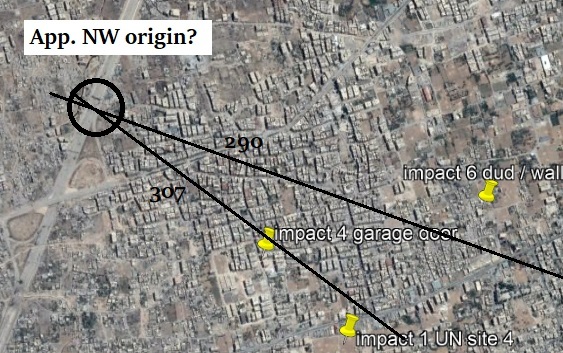 (The same UN report claims impacts there also showed direction clues pointing to the same base). "There are 2 major problems with the trajectory assumed for it: The range of a rocket with such poor aerodynamics, a large 60kg warhead, and a relatively small engine could never reach the 9km implied here. (Update: the UMLACA is now reliably estimated to have a range of 2.5 km). The report states the rocket points at azimuth 285. However, as shown here this implies a 5 degree angle to the wall, which the screenshots below show cannot be the case:"
I get 8 degrees, which is still about as far off - around 30 degrees or more - from all reasonable readings. But before these and other problems were known, the direction claim and its implications were hungrily swallowed and defecated by the mainstream media's presstitutes. They all knew the investigators were supposed to just follow the facts and not to pin blame, letting them credit the numbers as factual and not political. But instead, it seems the investigators, or someone interpreting their findings for this important report, strayed from the facts and wound up leaving a pin right next to the blamed party, ready for anyone else to notice and pin in place. So just as the U.S. and allies were using that pre-decided blame to exert leverage on Syria, along came these "precise" bearing apparently based on the science of falsely assigning blame. Then the unexplained specifics "buried" in the report were dug out easily and interpreted as implicating the government. The pin was jabbed in repeatedly over the following days by a number of useful idiots. The report doesn’t try to affix blame for the attack, but the facts it provides make it vanishingly unlikely that it was launched by anyone other than the Assad regime. The chances of this being some kind of attack by someone outside the Syrian government, already slim, basically have to drop to zero now, assuming you trust the UN’s facts as presented. That sounds about right. Added to all the other intelligence pointing in the same direction, there’s really no longer any case to be made that this was some kind of false-flag rebel operation. It was a chemical weapons attack mounted by the Assad government. Sorry, Rush (Limbaugh). The UN inspectors investigating the chemical weapons attack on two suburbs in Damascus last month weren’t supposed to point the finger at the party responsible for the killings. But even so, the Sellstrom report revealed key details of the attack that strongly suggest the government is to blame, and may even help identify the location from which the Sarin-filled rockets that killed hundreds of people on August 21 were fired." 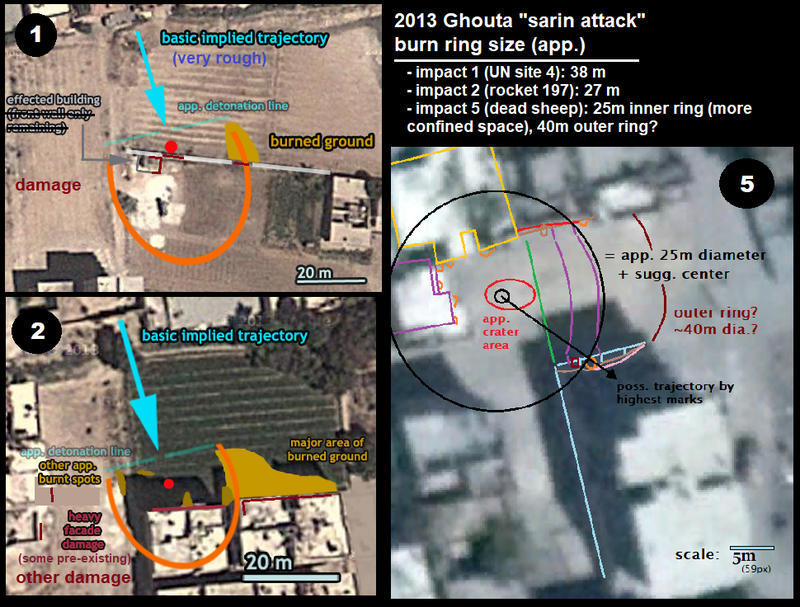 And HRW was there to notice it and pin away and to produce the widely re-used graphic. And now they'll never retract it, even though it's a baseless claim with a range that's scientifically impossible, and an angle that's plainly contradicted by the visual evidence. At the New York Times, C.J. Chivers on the 18th heralded: "some of the strongest findings to date that suggest the government gassed its own people" were simply "buried" (not planted) in the report from investigators "instructed to investigate the attack but not to assign blame." Still, they "listed the precise compass directions of flight for two rocket strikes that appeared to lead back toward the government’s elite redoubt in Damascus, Mount Qasioun..."
It's not a real compass heading, we now realize, but some other kind of line they decided to draw. But a retired Lebanese general, Elias Hanna, told Chivers it pointed to "the center of gravity of the regime, "... the core of the regime." That sounds like John Kerry's "the heart of regime territory." Remarks, Sept 4: "We are certain that none of the opposition has the weapons or capacity to effect a strike of this scale – particularly from the heart of regime territory." At first, they said this was based on "satellite detections" suggesting small rockets, but no big missiles, were fired from inside government areas about 90 minutes before anyone mentioned a chemical attack. (WH press office, Aug 30) When you think about it for a moment, that's not very convincing cause to think the ones responsible for the attack were also launched from there. They don't even mention seeing those. Or did everyone really wait 90 minutes to start suddenly pouring out reports by the minute? 90 seconds I would easily believe, and maybe even 9 minutes. But 90 minutes? But later, these "precise" but grossly wrong readings were provided by UN investigators, and used to widely reinforce the false claims that Assad was to blame. How and why does this happen? Who else was there to help? 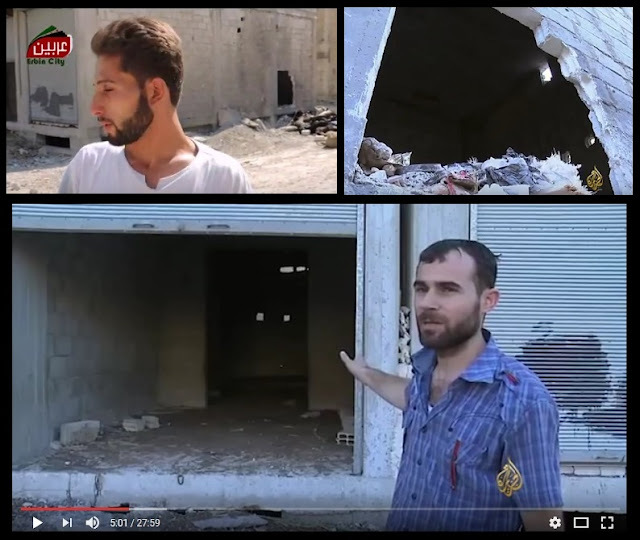 The US, the UN, HRW, and no surprise, Qatari propaganda outfit Al Jazeera. 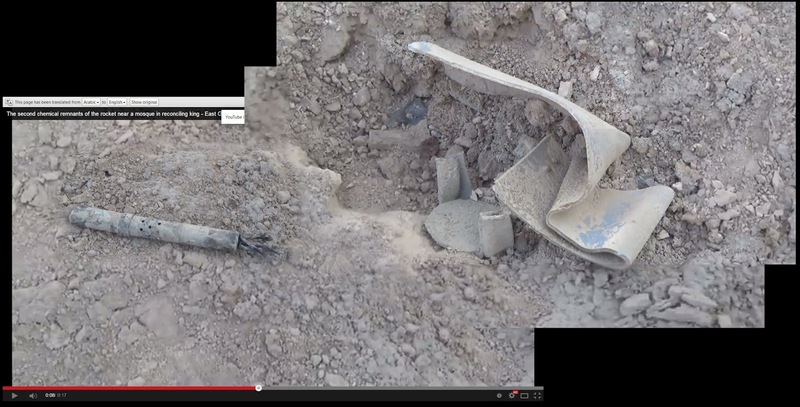 In a November, 2013 documentary (Youtube posting), they claim to show two rocket trajectories that bear out that reading. I had missed this at the time, but Higgins' Brown Moses caught it as 'new key evidence'). "Thank to the UN report we have an idea of the direction the rockets came from," he said in error (their angle is not based on the actual evidence, and he knows the suggested origin is far out of range). "... a recent Al Jazeera Arabic documentary about the August 21st attack might even provide more information," that, he did not note, is at least as sure to be misleading. 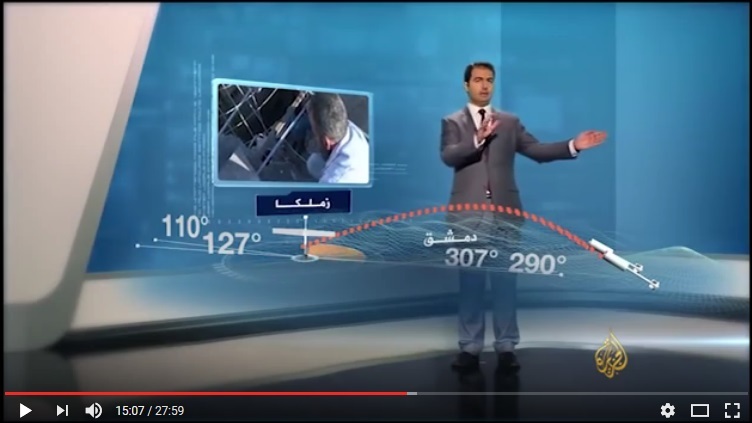 It's in Arabic, and if there were English captions, I didn't notice. So I won't consider what's verbally said here and focus on the visuals, which are interesting. We see some kind of Arab investigators in their own hazard suits, not OPCW folks, at each site, measuring the rockets and/or the damage and using some kind of protractor and compasses. There's no guarantee the readings mean anything, but let's just say maybe, map them out, and see how it fits. Here's the presenter showing these carefully-derived angles: 307 and 290° to firing spot, with an opposite direction of flight of 127 and 110°. 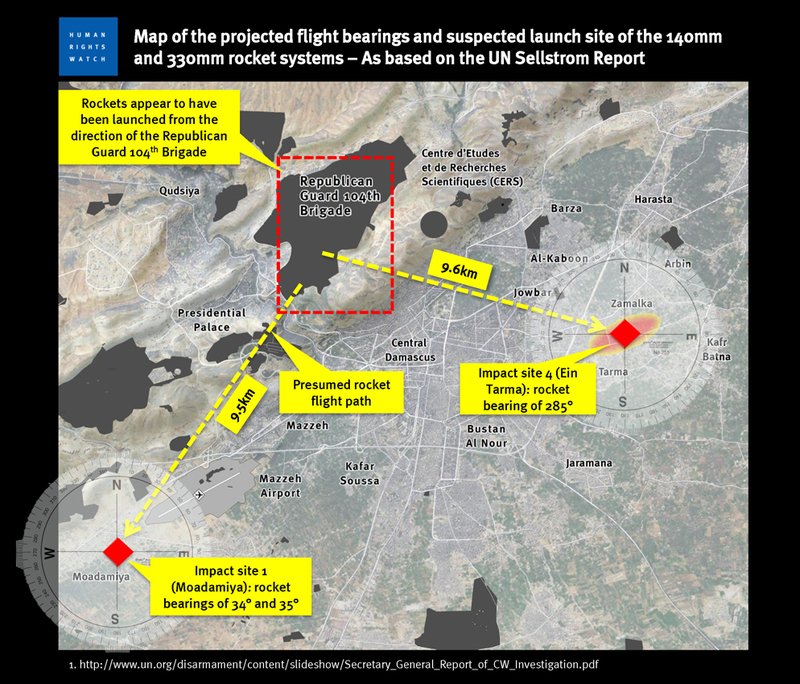 The program - apparently working closely with the UN investigators - suggests these two rockets flew on those lines the full 10km from the 104 brigade base. Presumably they drew their own conclusions in this regard, like other Assad-blaming media have. Higgins, reviewing a couple months later, after the Lloyd-Postol report, knew better. He only took the direction, not the distance, as likely valid: responding to a comment criticizing the unreliable source and its errors, Higgins said "it's possible for their range calculations to be wrong, even if the azimuths (direction to launch spot) are correct." And that's true. I suppose there were no "range calculations," just a desired distance on a fake line that was chosen. It's not just possible but necessary that this will be wrong. Still, the compass work could be valid. As for how it maps out - they don't show this, but doesn't come out very well. The spot indicated by the UN, as read by HRW et al. (9.6 km from impact 1/site #4, bearing 285), would be in the southern part of the sprawling 104 brigade base (depending: HRW's map shows it extending past what Wikimapia does, but the latter has random military areas there, with a brigade 104 "bus assembly" area within it - also, the military residence area and nearby shooting range at the base's SW corner are on the right line, but about 11km from impact site #4). Now, if we take that spot at 9.6 km, other rockets fired from there and hitting at the given angles must have landed roughly along the black lines here. Note that this would put them well outside the area of 12 impacts mapped (not very well) by Human Rights Watch, marked roughly in orange here. The same basic area contains all 6 actually geolocated impacts (just the three furthest out are shown here, to frame the area without cluttering it). None are remotely far enough south or west to be on these lines, especially the far-off 307. And of course, this is just if the rockets could fly 5x further than they could, which of course they couldn't. This Al-Jazeera's help, with their well-researched and carefully-framed nonsense. Not that the angles they give are at all impossible. In fact, readings even right around 285° come up - at the northern edge of the impacts area (impact 6, dud/wall), not at its southern edge, where the UN's widely-misread site #4 is. Angles kind of like 307 actually seem to predominate. All the NW angles vary over space in such a way that they seem set to converge, probably in or fairly near the black circle here (app. working area per Michael Kobs, and it seems pretty good to me, at least for impacts 1, 3, and 6, likely for #4 and 5, but maybe not for #2). (Note: this graphic is a bit off: the black circle should be further north, and these lines should run from there - impact 1 at bottom runs ~320, so the 307 line shouldn't be so close. This is not right yet, but closer than we have been.) If we take these two new headings and have them originate here, it makes a lot more sense - both lines run right through the established attack area (more across the middle or north part of it than shown). That would be at least 5 of the rockets fired from around that spot (which seems to be very near the front lines at the time, but probably in insurgent hands - for my part, this will take a little more review). The fact that these do not line up with the Mt. Qassioun story suggests they weren't made up for that purpose. Therefore, I find it likely these are real readings, maybe incorrect but logical. What's misleading is how they're presented in a placeless context that makes them almost meaningless as supports for the UN report's unsupportable fake angle. So 290 and 307 might be real damage lines for two scenes we don't yet have placed. If one could find fresh damage along these lines, that might be the locale of the impact. I looked briefly, and found no obvious match. 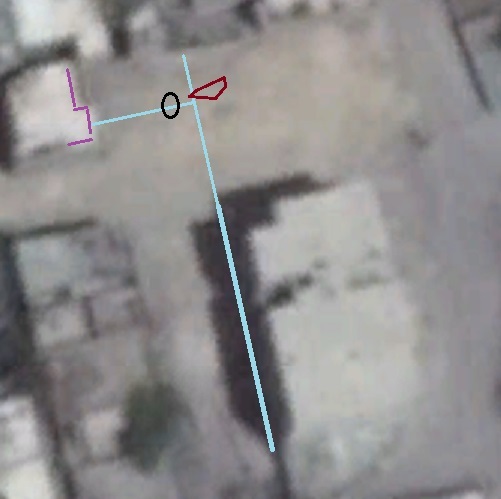 But I did notice a spot of interest almost on the 290 line; about 1.5 km from the possible highway firing spot, is a patch of ground possibly darkened between Feb. 20 and Aug. 23, 2013, with a new black dot added, in an open lot next to a mosque. But it's not the clearest, and doesn't seem to fit with either scene shown (both seem to be in or at structures, not in an open lot). However it could be another impact on about the same line, so I'll show it here. Consistent with patterns so far, it's encouraging that HRW's map does not include this spot, but does have an impact mapped quite nearby to the east (bottom: my spot in the red circle, theirs are red dots. In time, we may have these spots identified, and in the meantime, I'll add them to the masterlist as impacts 8 and 9, unplaced, but already with alleged directions attached. While this post is titled "How UN-OPCW Falsely Fingered Syria for the Ghouta Attack," the method outlined and exposed here isn't the only way. As noted, they got similar readings in Moadamiya (Western Ghouta) that I haven't analyzed, and that could be correct. But by being falsely lumped with the wrong reading into a neat story of one government-held firing area for the whole attack, it would be deceptive. 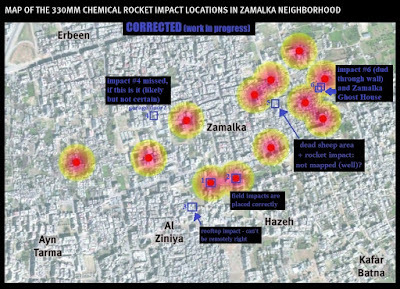 Even if those Moadamiya shells were fired from that base (as a different weapon with a different range, as far as I know that could be), the "volcano" rockets used in East Ghouta (Zamalka and Ain Tarma) could not have been. So we're dealing with two different firing areas, with one having to be around the front-lines, where the government allegedly used these crude weapons to launch their sarin attack for no logical reason. 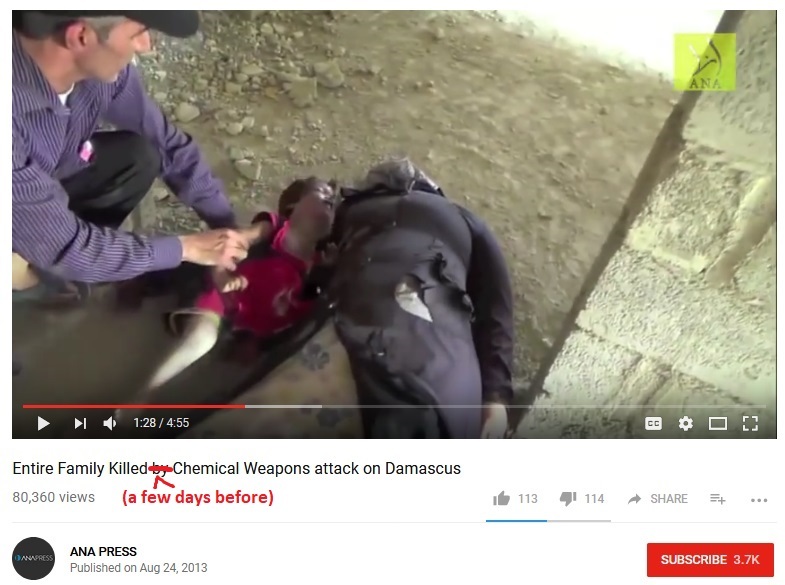 On video, the dead do not look like sarin victims, but rather like folks gassed with chlorine or carbon monoxide, depending. An autopsy or a sampling of their tissues could perhaps prove that it was sarin anyway. But the UN investigation decided they were all killed by sarin, in contradiction of the visual record, with no biological samples to back it up. 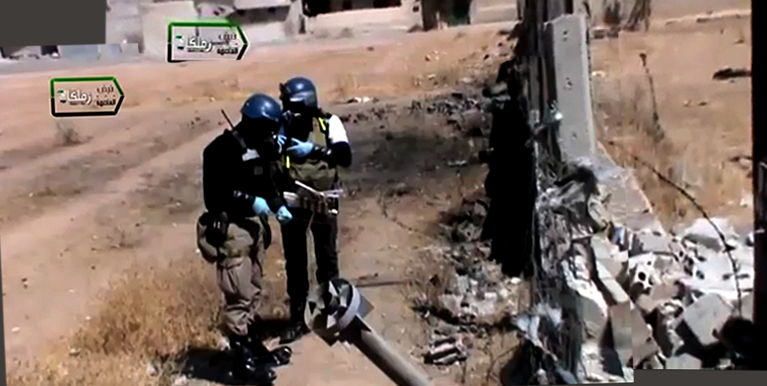 They took samples, and those did show sarin. But those came only from alleged survivors, people who were screened and provided by opposition sources, who could be misleading stand-ins, who brought unproven stories about the events, and who seem to have been exposed to low doses, perhaps on a voluntary basis. It's far from proven that the UN-OPCW were completely faked out with the sarin results by area-contamination and voluntary low-dose propagandists. But it can't be disproven either, because the investigators chose a shoddy method for discerning the truth. 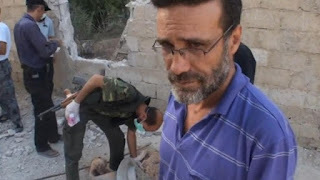 Considering how they also managed to mangle the rocket forensics to the same end, it seems to me they did that to avoid learning or helping to spread the truth, in favor of sticking to the script and blaming Assad like always. We turn now to my impact #5, the scene with about a dozen dead woolly sheep, allegedly killed in the sarin attack, that were piled up and partially burned. (Just why isn't clear; out of worry that sarin was contagious, or just to prevent disease or - see last section here). I didn't even realize until recently that this scene was also an apparent rocket impact site. Eliot Higgins had a look at it (Brown Moses blog) as "third volcano", Jan. 30, 2014), thanking Chris Kabusk for "for help finding the impact locations of this rocket." Kabusk's analysis of it back in 2013/2014, and accurate geolocation are explained here in images. That place was set with a little-seen view facing east. With this, I verified the match with some key features highlighted at right (east photo at bottom). This is a pretty undeniable site match. 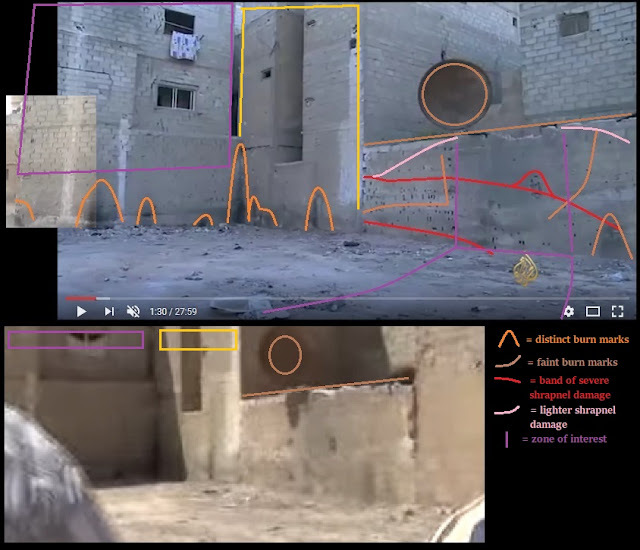 A long video with a host I've seen in other videos, taken to this spot, then from into this east view, left up that street to the north, and around the area, where he's shown several places where livestock was said to die in the attack. Some scenes are used below help establish the attack site details. 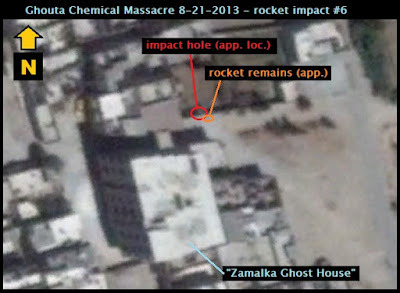 Notably, the famous HRW map of 12 impacts does not include this spot, at least not accurately. The actual rocket impact is hard to place exactly, but it must be somewhere in that dirt lot. The apparent "crater" here is little more than a dent, not unlike other areas. The alleged rocket is gone, with just minor scraps left behind and freely re-arranged. One piece is perhaps a detonator? (more images via ITV news, including scraps from impact 6, but all taken as one scene). There's no proof in that of a rocket impact, but the surrounding details suggest there was one. Nearby is a hole in the large building's north face. 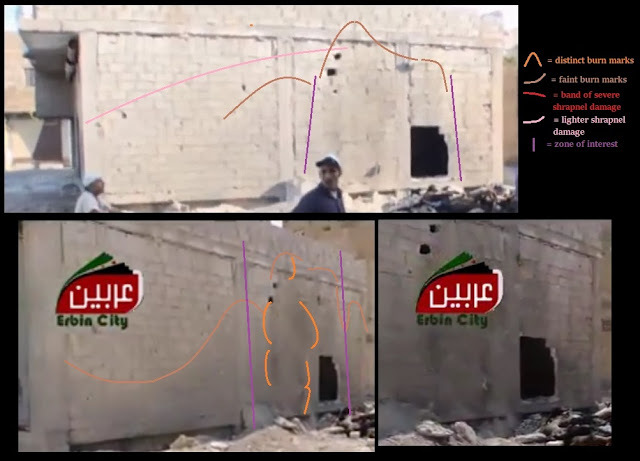 Quite likely, this rocket hit at a steep angle, bent forward on impact like with impact 2 and 6, with the heavy engine-tail end bending forward, then breaking free and flying through that wall. One video shows the crater up close and, by panning left, the hole and sheep pile, in one continuous view. Chris Kabusk made this good montage of panning frames to try and assemble the space between. His result puts the crater almost due north of the hole, or about on a line with the building's west wall. He also notes a possible second hole inside it would have to line up with. Just where is the impact? My first effort just took a dark spot as possibly it (outlined in red below - it's visible in Aug. 23 satellite images of the area, while the crater isn't) But Michael Kobs showed me how it's apparently a little bit west of there (black circle below). Here, stills from the long video were most useful (on the left), with a couple of other views on the right. So the impact is a meter or two west of the west wall's line, which instead lines up with the edge of that more visible dark smear near it. I estimate this as roughly 1/5 of the way between the green line and the wall behind it, roughly on a line with the white line marking the middle of the extruded section. So I would place it like so - somewhere in that black circle - or maybe it should be a little east, closer to the red area, or they should both be a bit further west. I probably under-did the offset of the purple lines here (to mark building edge at ground level, not roof level - but it should be a bit further back - this building is about as tall as the larger one, and we can see its height from the blue line to the roof). This is still inexact and debatable, and I suppose the graphic I already did below is a bit off, and the notes. I'll be revisiting this. 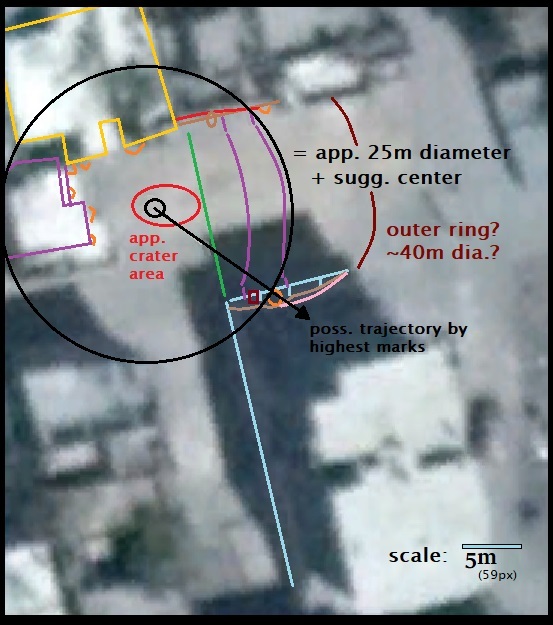 Again with impact 5 we see clues that the rocket used was a fuel-air-explosive (FAE) weapon, or ...whatever it is, something with a sort of ring of fire effect and varying degrees of explosive or pressure-wave damage (usually mild). See early ACLOS discussion on this possibility, and note I'm no expert and still haven't even found a good image of a weapon with such effects to compare. But whatever it is, if it creates fire or intense heat and explosive pressure, it would of course destroy any fragile sarin vapor the weapon tried to release. It would mean the rockets couldn't have delivered sarin, as almost everyone so far believes. The reason it would turn up in tests by the UN-OPCW a week later is because the rockets and/or their surrounding were contaminated with planted sarin prior to the testing. Here we see even less damage than in some cases, but then it's an unusually wide, open area. This big stitched panorama by Kabusk shows the overview, to which I've added marks and notes. In orange are apparent burn marks. Considering its suggested angle, it makes sense we would see lower and more distinct scorch marks in the back (towards the N-NW). I don't know why it would or wouldn't form into discrete, regularly-spaced little columns likes this. And it makes sense that to the south/SE, in the direction of travel, we'd see a higher, wider, and fainter burn mark across the building's facade. With heat tending to rise, but with this whole thing starting at ground level, it also makes sense the ground should be lightly scorched gray all over (interrupted by that reddish spray of impact dirt, from the crater to the S-SE). Red marks the largest apparent shrapnel damage; closer, clearer views show a larger number of smaller marks. It's not clear where these sheep were at the time of the incident, but probably near, and perhaps right here (no clear signs of any pen, and if that's their shed, built into a residential building, and their little door was coincidentally damaged, as some wonder, well... it's got no access ramp anyway.) It's quite possible some of the sheep were nearby and were affected by the blast, killed by the blast wave directly, or by its suffocating ("vacuum") effects, and likely burned by its fire dome. That could be why they were piled and burned a bit, to explain why some were burned. If so, they would try to bury the injured ones more in the middle to make them less obvious. In fact, some of the sheep in the middle seem to be badly damaged; two, or one in two pieces, seem to be a single pair of legs and tattered parts of a body (see beneath the half-burned slat of wood added to this part of the pile), in the area Kabusk circled in his graphic above. This was to note "ground and dead" animals that seem "dry from agent dispersal." Of course sarin isn't known to dry animals any more than it's known to rip them up, and they seem to have dried by burning, perhaps via the dispersal and ignition of the agent (some kind of fuel) carried in that rocket's tanks. That might actually have been what he meant - anyone who looks at these site should start to notice the little burn marks and such, and start to wonder. This might be a barn inside. That could be a preexisting door to let them out. It seems to be a vacant building. I wondered if that was a big blood smear on the rolling door around the corner. I still do, but it's probably not. May be related anyway. Air holes seeming pre-punched in the walls, raising questions about the few external holes. Mapping the burns: Whatever all this means could be debated, but here it is sort of mapped out, and compared to my two earlier "FAE" analyses. I still don't really know what I'm doing here. but it remains pretty consistent.